The End of Thermionic Valves ? 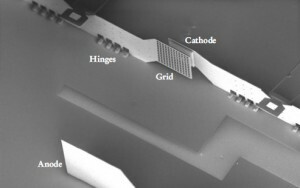 Recent advances in ‘cold cathode’ technology may be able to overcome some of the deficiencies of traditional electron tubes, which for the most part, rely on thermionic emission to emit electrons. An electron tube that employs a cold cathode would be able to overcome the disadvantages of traditional thermionic valves (bulky, tedious warm up times and large power consumption) whilst maintaining high output power density. It pertains to a new type of futuristic, silicon based …. Triode (!!!). A triode that does not have a filament. A triode that works on the principle of a COLD cathode. A triode that is engineered within a piece of silicon, and is of nanometric dimensions. A very intriguing development in …. the future … of TUBE technology ?? Ekaterina Bayguzina, Qinxin Liu, Ngai-Han Liu, Ye Tian, Hamza Javed, Yunzhi Wang. Field emitters can be utilized as an alternative to thermionic ones. The emission of electrons occurs by applying a large electric field, which reduces the tunneling barrier of electrons in the material allowing them to escape easily. However, either a very large electric field is required or sharp emitter tips for emission tips. All attempts at producing field emitting tubes have had only limited success (see report for more details). However, with breakthroughs in nano and micro-electromechanical technologies, a miniaturized cold cathode vacuum tube has successfully been produced. 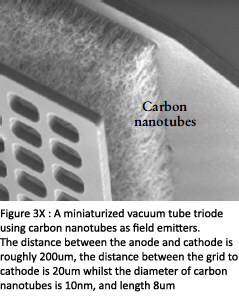 Carbon nanotube arrays are used as cathodes, and since they are naturally very narrow (10nm diameter), this makes them ideal field emitters as they can emit large current densities at low electric fields. The miniature triode is shown below. The miniature triode exhibited much of the same voltage-current relationships as its larger predecessor. As we can see, only modest gains were achieved and this in addition to obstacles relating to stability of the device means there is still a long way to go before this technology has commercial applications. However, research in overcoming these pitfalls is being undertaken, and improvements have been made to the original model that allows higher current densities to be emitted. By overcoming existing obstacles, and optimizing the design, the device could have applications in wireless communication systems as well as operation in space as on-chip amplifiers.